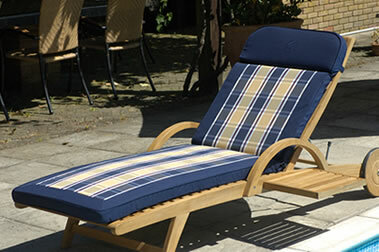 The Colonial Collection is made from 180 gram Polyester and is therefore naturally rot, fade and stain resistant. This classic range of cushions is boxed with a double piped edge. Every product in The Colonial Collection boasts The Colonial Collection embroidered logo. Polyester fabric with boxed double piped edge, zipped removable cover. Polyester fabric boxed double piped and zipped removable cover with embroidered logo on headrests. Polyester fabric single piped edge with zipped removable covers. Polyester fabric with boxed double piped and zipped removable covers. Take a look at our cushion display stand, specially designed to hang and display our range of cushions.